There are many beautiful cities in Vietnam to go to and explore. There's the beautiful red sands of Mui Ne, Mekong Delta, Halong Bay, Ninh Binh, Sapa, Hanoi, Dalat and the list goes on. But one of the reasons why I choose to go Nha Trang from Ho Chi Minh City is because I wanted to try out mud bathing. We are so blessed to be staying at Prime Hotel Nha Trang because this hotel is part of Haidang Group which gave us a 30% discount at Galina Mud Bath and Spa. If you're going to stay at these group of hotels then expect a discount from them too. My husband is not keen on joining my mud bath and spa and experience so I asked him to document my experience instead. The mud bath and spa is located inside Galina Hotel and Spa Nha Trang, Vietnam. It's only a short walking distance from Prime Hotel Nha Trang. In fact they are built back to back from each other. That saves us a lot from paying a taxi fare. You can choose 350,000 VND good for 1-2 pax sharing or 250,000 VND for 3-4 pax sharing. Of couse I choose the 1-2 pax sharing cause I don't want to be with someone who is a stranger to me. But had I had know I would have choose the 3-4 pax sharing since I'm the only lone customer using the service. Since I got 30% discount, I only paid 249,000 VND all in all. I was ushered to the women's locker room to change to my swim wear. Of course, I didn't use the swimsuit that is part of the package since I believe that thing should be for personal use only. We then went to the 4th floor and then I was asked by the spa employee to take a shower first. After the showering, I was then lead to the mud bath area. It's like a jungle out here. They then filled the tub with the mineral mud. Wow! It was warm and feels really smooth on my skin. I love it! Can I do this everyday? Ha?! Ha?! I wanted my hubby to try it too but he just can't be persuaded. About 20 - 30 minutes in the mud the spa employee told me that it was time to shower. Like what?! Can't I soak in till I'm happy about it? Waaahh!! It was only a short a lived experience. That's sad! However, I enjoyed it. Moving on. I know! I move on easily. There are small sand particles that clung to my swimsuit after the mud bath experience and I find it rather annoying because it's so hard to remove. Ugghh!! That shower is like rain! After my battle with the small sand particles, an employee gave me a bottled water and ushered me to the steam room and afterwards the sauna. Gosh! It's hot in here. Next is the hydro foot massage. Don't be fooled! That water is so hot. Hehehhe! I was then lead to this area on which they call the hydrotherapy. I walk through squeaking because these squirting walls feels like piercing through my skin. Ouch! 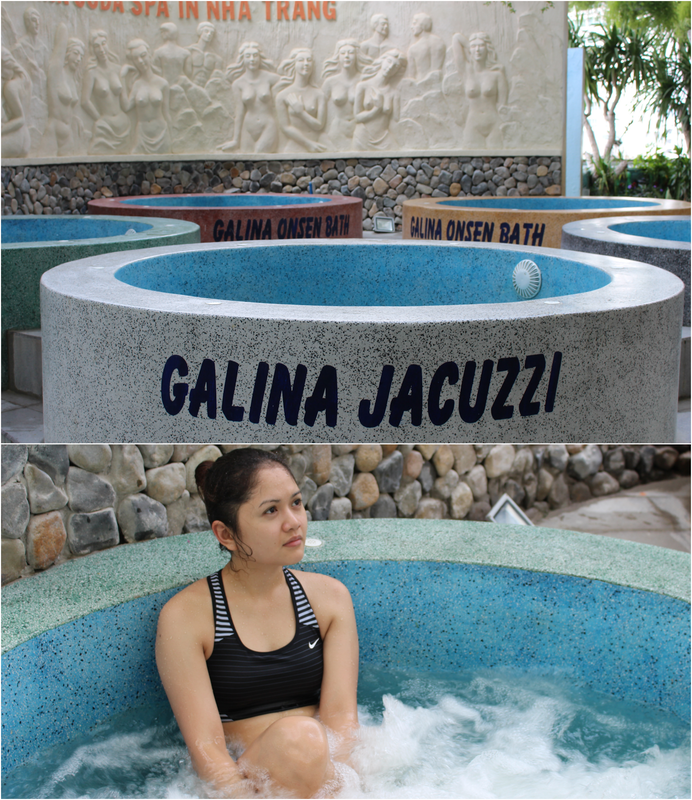 Next is the jacuzzi. Ahhh!! It's very relaxing. After dipping myself at the jacuzzi, they then ushered me to the swimming pool but I've decided not to use it because I find it rather small. So I just showered afterwards. I find showering, after the whole spa process is done, rather annoying because they don't offer you a shampoo and a body wash. I mean, can't I shower myself properly at your spa? So I just walked back to my hotel to do this. I thought that this should be an essential part of their service. The spa employee's don't speak good english but somehow it's been a miracle how we've manage to understand each other. I was somehow puzzled why there is a process to it. I mean, can't I use what I wanted to use and use it again and again? Overall, it was a good experience especially if you only wanted to try the mud bath. So yes, I would suggest you to do it too. 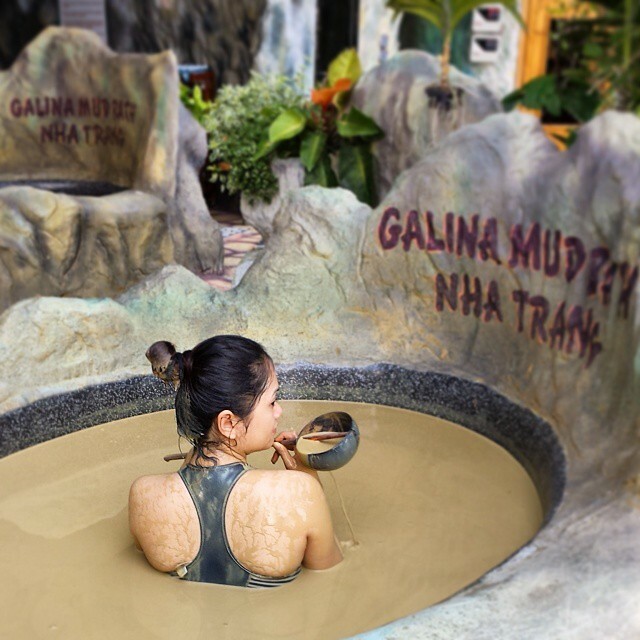 There are many places in Nha Trang that offers a mud bath service. You can tryout Thap Ba Hot Spring Mud Bath and 100 Egg Mud Bath. Since we only have limited time, we choose this one at Galina because it's the only mud bath located in the city center and near our hotel. Do check out my Vietnam Travel Itinerary for more travel tips and inspirations.